I am now two days away from my flight out to Rio de Janeiro and I am in full blown packing mode. When most people go on a long vacation, all they have to worry about is what clothes to pack. I have that issue too, but more importantly, I have to figure out what camera equipment I need to bring for me to be successful at the Olympics. You might be thinking "You are just packing now?" and you would not be the first person to think that. But I can assure you that the planning has been going on for months now. Now only for the cameras and lenses, but all of the accessories that I need as well. 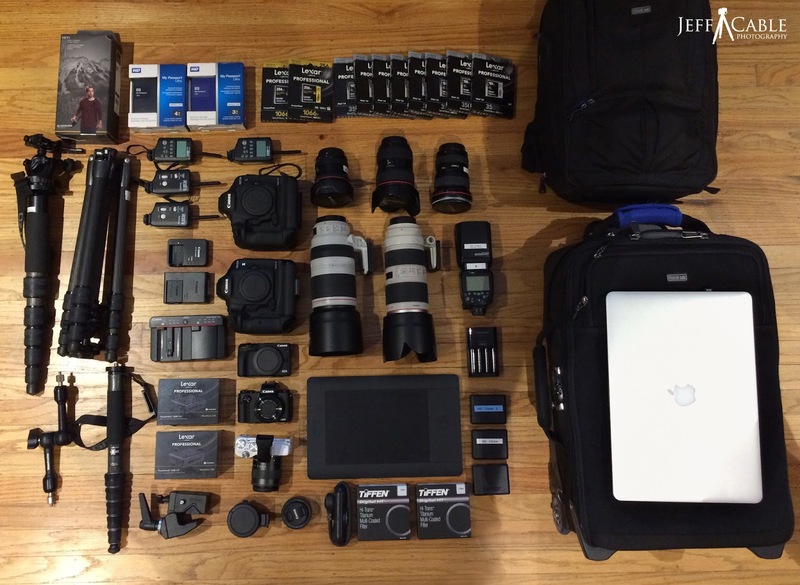 So...finally to answer the question that so many people have asked me about in the last month, here is a summary of all the photo equipment I am taking with me. The main cameras that I will be using in Rio are the new Canon 1D X Mark II. I will have 3 of these bad boys with me and plan to put them all to good use. Photographing the athletes at the Olympics is no easy task. All of these people are the best at what they do, and they are usually very fast! Having a camera that can fire off at 14 frames per second will really help me to grab that one image at the peak of action. For the past 4 Olympics, I have always walked around with the big cameras to take photos around town, but Rio still has it's safety issues (as I mentioned in the last blog post). So, for this trip Canon was nice enough to lend me a Canon PowerShot G5x and a Canon M3 mirrorless camera. Both of these cameras are small and unassuming, but they take excellent photos. I will feel safer walking around with these little cameras, than a big monster like the 1D X Mark II. 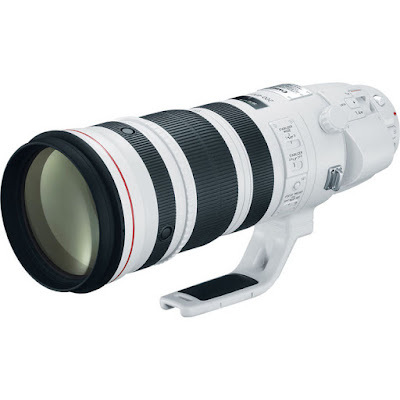 The one lens that I plan to use most often at the Games is the Canon 200-400mm lens. I love this lens because, along with being incredibly sharp, it gives me a great zoom range. This lens has a built-in tele-adaptor, and with a flip of a switch I can shoot anywhere from 200mm all the way to 560mm. If you have been following the blog for a while, you know that I prefer zoom lenses so that I can reframe and shoot both wide at tight. You will notice that the Canon 200-400mm lens is not in my gear shot. The reason is, that lens along with another 1D X Mark II are waiting for me in Rio. Canon was nice enough to ship my loaner units for me. This is very helpful to me, since I already have enough gear to carry as it is. I am also bringing a couple other longer lenses with me. I am going to bring the newer Canon 100-400mm lens because, although it is not as great as the 200-400mm lens, it is smaller and lighter, for those times when carrying the larger lens is impractical or may not be needed. I never leave home without the Canon 70-200mm 2.8 lens because it is my all time favorite lens and perfect for the sports where I am close to the action. For medium and shorter focal range photos, I am bringing the Canon 24-70mm II and Canon 16-35mm lenses. I am even bringing the Canon 8-15mm fish eye lens for those times when I want to get even more creative. I always go to the Olympics with a lot of memory cards, and this year is no exception. But for the first time, I will be taking along a whole bunch of Lexar Professional 3500x CFast cards, which work in the new 1D X Mark II cameras. These things are smoking fast and will allow me to shoot faster and download in half the time of the traditional CompactFlash cards. To support those cards, I will have 4 of the Lexar CR2 card readers which connect to my computer using Thunderbolt or USB 3.0. Those will be plugged into my trusty 15" Macbook Pro. Since the MacBook Pro only has a 512GB SSD, I am bringing a bunch of Western Digital 3TB and 4TB Passport drives to hold all the images I will be capturing. I am a firm believer in having my images in more than one place, hence the reason for having numerous external drives. And just in case something were to happen to my laptop, I just cloned the SSD onto two Lexar 512GB Portable SSD units to keep in safe places. If the laptop were to get lost or stolen, I can re-image the drive and get back up and running quicker. It is sad that I have to take these precautions, but better safe than sorry! Since editing is so much easier using the Wacom Intuos Pro tablet, I am going to take my small one with me. I actually prefer the medium size tablet, but don't have the space to take it with me. I am also bringing my Gitzo travel tripod for any night shots that I might take. I don't expect to use this a whole lot (since tripods are not allowed in any Olympic venue), but I hope to get some nice night shots of the venues in the Olympic Park if I have time. For everyday shooting, I will likely switch off between using the BlackRapid straps and the Spider Holster. Once again, this will take some of the weight off of my back. I guess it goes without saying, that with all these cameras, I will have a bunch of batteries and chargers with me. I will have 4 batteries for the 1D X Mark II cameras, two each for the G5x and M3 cameras and AA cells for the pocket wizards (which I use for firing my remote cameras) and one Canon 600 EX-RT flash that I will have with me. And, of course, I have to have my charging cables for my phone and other gadgets. To protect my lenses from the elements, each of them will have the Tiffen HT UV filters in front of them. With the speed that we are working, it is not uncommon for me to drop a lenses at least once during the Games. I would rather crack a filter than the front element of my lens. How am I transporting all this gear with me? I am packing all the camera gear in two ThinkTank bags. I have the ThinkTank rolling bag and a Thinktank Streetwalker HardDrive backpack that will be completely filled. And no, these will NOT get checked as luggage. These will go onboard with me while my big suitcase of clothes goes under the plane. There are two very important documents that I have to have with me. 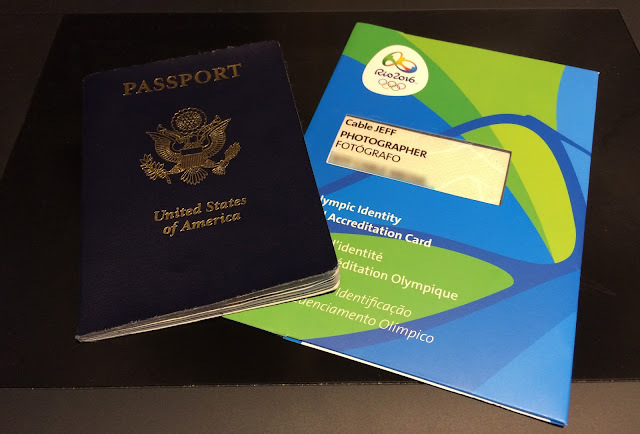 These are my passport and my Olympic credentials. Both are needed to get into the country (since the Olympic credentials also act as my visa for Brazil). For redundancy sake I have extra photo copies of these and I have scanned them (along with my credit cards) and put those in the cloud for emergency access if anything were to happen to the originals. Hey, it is all about redundancies, right?! 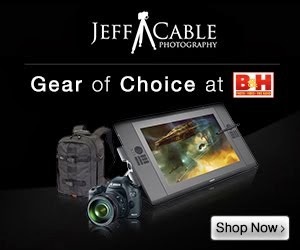 B&H Photo was nice enough to create a page on their site with most of the equipment I am taking with me. You can access that page from the banner at the bottom of this blog. I think that covers just about everything I am taking with me. I hope that this helps you understand the thought process and packing challenges. It is a lot to take on a trip, but I hope that all of this helps me create some really nice photos to share with all of you. The next blog entry will likely be from Rio. Stay tuned and Obrigado! Having to pack three different chargers... ugh. Just a set of adapters, Canon, that would work! I wish you the best on your trip to the Olympics. As always I will be waiting for future blogs with pictures and helpful photography tips. As a sports photography lover, I am exiting and I am not the one going so, I can imaging how you feel. and as always thank you for the time you put out for us your followers. Will Photo Mechanic be along for the ride too? Good luck and safe travels ! I'm waiting I anticipation for many more blogs and images from your Rio experience, and hopefully see you face in the background of some of the TV coverage! Best of luck with the event, I'm wishing you and all involved in Rio 2016 all the best energies! Be careful there! It's my city and it is very pretty but it is also very dangerous. You mentioned that you alternate between Spiderholster and black rapid. I do the same but (and excuse me if you already do this) but I mounted a tripod plate and black rapid connector to the bottom of the spider holster plate. It looks a bit odd but I can then use the holster with the black rapid. I can relax, knowing that if I drop the camera (or someone manages to lift it off the holster) it is still attached via a strap. Likewise, I can either let the weight hang from my shoulders or my hips, depending on whether the cameras are engaged in the holster.